This plugin draws spherical helix, also called a luxodrome. It is a spiral curve on the surface of a sphere, which crosses all meridians of longitude at the same angle. It is another type of spherical spiral, other than the Archimedean spherical spiral I posted a week ago. I like to think of it as the path a ship would trace across the globe if it always pointed in the same direction relative to true north. The curve below is an example of a course that proceeds slightly north of east, by 5 degrees, at every point. M.C. Escher used this curve in his drawing, Sphere Spirals. 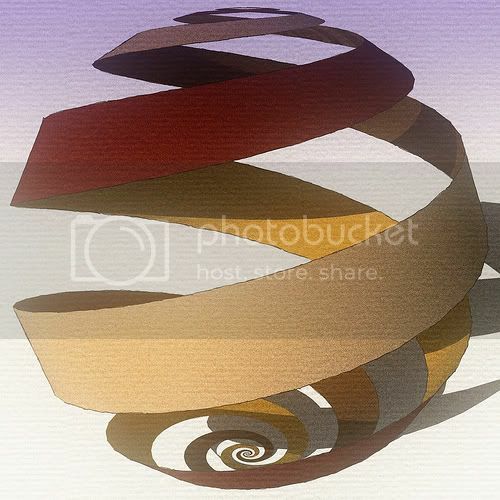 Using a lofting plugin to create a surface between two spirals, and then making 4 copies of the "ribbon", I constructed a crude depiction of Escher’s drawing in SketchUp. More accurate. Computes the exact values for the points on the curve. The Loxodrome Plugin is at: regularpolygon.org/plugins/loxodrome.php. Last edited by Regular Polygon on Thu Dec 08, 2011 8:42 am, edited 2 times in total. Yeah, geometry has its own sort of beauty -- one reason why I prefer graphics programming to web development. Thanks for the cool plugin. Woohoo! Just love your plugins Mr. Polygon, thanks a lot! It's kind of fun with Proper Animation. That is cool Dave. How did you do it? I made a spherical helix, copy, rotated it 60 degrees (I think) and used Chris's Simple Loft to make the ribbon which I copy/rotated to make the other two. Then I set up a pair of scenes and used Proper Animation to get a start and end position. the difference between the two positions is that the ribbons were rotated 180°. The funny thing is that when I switched from scene to scene, I got what you see. I was kind of expecting something like a barber pole but this was cooler. I made a video screen grab with Snagit and an animated GIF in VirtualDub. have you really used Chris's Simple Loft to make the ribbon? As far as I Know about it we can't skin two joining curves with it!! If there is a way, please be kind to report it. thank you for this new plugin. I have I think bookmarked each of them. In both cases I used Simple Loft and set the number of segments to 1. The ends of the helices are trimmed off so they are close to in alignment. They actually don't touch each other. It does seem like a long wait for the plugin once you start it but you just wait a little bit and it creates the skin just fine. Your super computer may be much faster than my old dinosaur. As far as rendering the first one, I used some sketchy line style and rough paper texture style I have (can't remember which) and then exported a JPG. I added some grain, haze and the purplish gradient in Picasa. The link at the bottom of the original post should take you to Regular Polygon's blog from which you should be able download the plugin. More playing. I should be doing work. A spherical barber pole! That looks great, Dave. .../I added some grain, haze and the purplish gradient in Picasa. Clever & Simple as usual dear Dave. Thanks a lot , simon. The original version used an approximation to compute the points on the curve -- unfortunately, I couldn't solve the math for the exact equations. Since then, I came across the equations that do compute the exact values for the coordinates of each point. They are implemented in Version 1.1. The difference in the spherical helix between the two versions is not really noticeable. But, if you are doing something that requires accuracy, then it might be worth downloading this latest version. Perhaps it is time to bundle your plugins into one folder with a toolbar. I'm sure that CADFather could come up with some pretty good icons. Well, I only have 8 or 9 plugins at this point. Once I hit an even dozen, I should release an author-menu type plugin. That would be an option for people who like to organize their plugins by author. That would be good, but a toolbar would be better (well, for me anyway). What new plugins do you have in the pipeline? Thanks for your feedback, Bob. I'll think about your toolbar suggestion -- or, at least, let it simmer on the back burner. So, what is in the pipeline? Well, when I am not distracted with the 3D printed lamp Design Challenge, I am working on a new project. All I can say at this point is that it does not involve geometry creation -- for once. If I don't hit any snags, I should have a lot more to say about it in a couple weeks. I look forward to being surprised and delighted.